Let’s face it, being green ain’t easy! 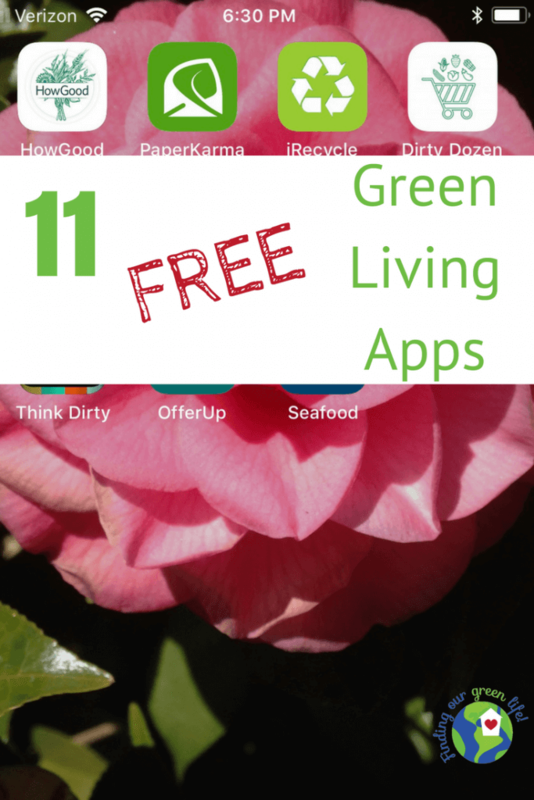 It takes some effort to live “the green way”, it’s a choice that you consciously must make but thankfully, there are plenty of smartphone apps to make green living easier. How people were able to do it before the invention of the smartphone is beyond me. I often wonder how we survived before the internet. 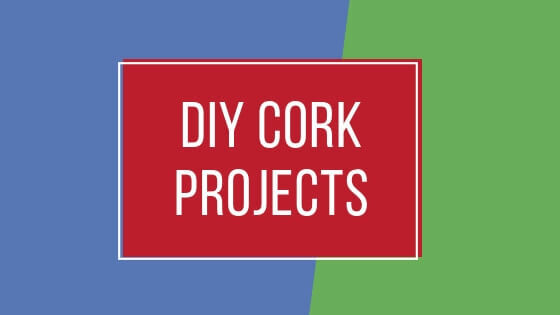 Whether you’re interested in recycling, purchasing products that are safe, selling your used stuff, reducing junk mail, finding a farmers market or something else – there’s an app for that. Heck, there’s an app for anything you can think of. I’m definitely guilty of shiny object syndrome. When I learn about a new “green” app, I’m headed to the App Store. Apps are so easy to download, just make sure you have enough free space on your phone. My favorite price is FREE so all of these are FREE. This app is like your product information health safety sheet. You can search products, browse categories or scan UPC codes to determine potential health impacts of specific products. Ingredients are evaluated by experts in the fields of health and environmental sciences and given a rating. I definitely find the app useful when I run across a new product and want to make sure it doesn’t contain any of the 5 harmful food additives that my family avoids. When you search or scan a product UPC code, a rating is given as well as “better for you” alternatives to that product. You are also able to view information and rating details about the product. Products are rated on a scale of 0-10 with 0 being the worst and 10 being the best. A 7 is rated as “significantly above average”, that’s where I like my products to hang out. An added component that goes into the overall rating is how socially responsible the company is. So if you want to avoid companies that aren’t being kind to the environment, this app can help you do that. This app rates beauty and personal care products. The cosmetic and personal care industry is not regulated quite the way the food and drug industry is so it can be quite difficult to find products that are safe for our bodies as well as the environment. 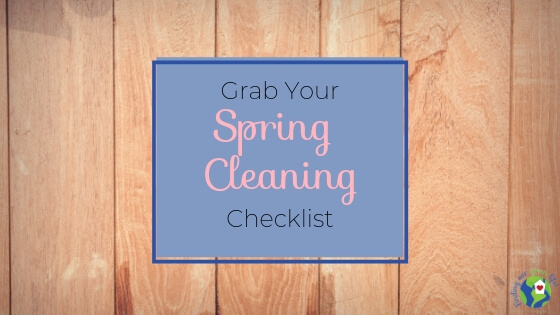 For more information on what harmful chemicals are lurking in many personal care products and how to avoid them, I’ve got a post for that. This app combines the GoodGuide app and the Think Dirty app, in one. Not really but sort of. The GoodGuide blog dedicates a blog post to comparing and contrasting their app and the Healthy Living app. 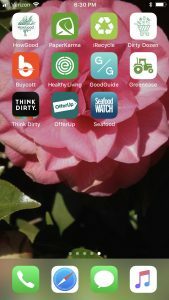 The Environmental Working Group (EWG) used to separate food from personal care products in to two different apps but has combined them into one nice app. The rating system is basically the opposite of GoodGuide, a 0-2 rating is low hazard and a 7-10 rating is a high hazard. I prefer my products to be no higher than a 4. Honestly, I use all 3 apps because none of the databases contain all the products and some products just aren’t in any of them. This is a pretty cool app, I could get lost in it. It rates everything from sourcing to production to organization, so it’s sort of the story behind the product you see on the shelf. This is where you find out if the company you are supporting with your hard earned dollars are doing their part to be socially responsible. At the moment, it’s fairly limited in which products are included but I’m sure it will expand as time goes on. This app by EWG will tell you which 12 produce items have the highest levels of pesticide contamination. If your budget allows, this is where I would purchase the organic variety. The app also contains the Clean 15, which means the 15 produce items with the lowest levels of pesticide contamination. I purchase the conventional version of these so my budget will allow me to purchase the organic variety of the Dirty Dozen. This app by the Monterrey Bay Aquarium Seafood Watch program helps you choose fish and seafood that is fished and farmed in ways that support a healthy ocean. The app will tell you Best Choices, Good Alternatives and which to avoid. We don’t eat a ton of seafood or fish in our house but I do like to keep this on my phone just in case. This app enables you to truly vote with your wallet. You get to choose what campaigns are important to you and then scan a product barcode and the app tells you if the manufacturer of this product supports a campaign you are interested in or conflicts with it. Then you are asked if you will buy the product or not. You can then choose to share why or why not with the manufacturer via Facebook or Twitter, all from the app. No one likes getting junk mail. It just takes up space in your mailbox that could be used for that HUGE check from Publishers Clearing House, right!?! Isn’t that the “check that’s in the mail”? This app allows you to take a photo of junk mail and request to be unsubscribed. Think of how many Money Mailer’s, lawn treatment mailers, real estate mailers, etc you get every week. I love getting mail but not junk mail. Earth911 brings us this app and I LOVE it! It helps me figure out where to recycle all those random items I’m trying to get rid of that I can’t recycle through my curbside hauler. Just pick a category and it finds recycle centers based on your current location. If you’re not familiar with Earth911, you need to hop on over and check this website out. It’s chock full of answers to just about anything and everything you could possibly need to know about being kind to the planet. It truly is the first place I go whenever I have a question about whether something is recyclable or not. This app helps you locate retailers and restaurants who source their products and ingredients from local and sustainable farms. You can select criteria such as local, organic, sustainable, vegan, etc. I found it’s easier to locate restaurants than it is retailers but I imagine that might be different depending on where I am in the US. Searching by name instead of cuisine or hood also gave me better results. I was happy to see that several restaurants that I’ve been to before are listed in the database. This is another one that I suspect will get better with time. Facebook has their own marketplace feature and there are plenty of Facebook groups that do buy, sell, trade but I like that this app shows photos of what’s available and to learn more, you just click on the photo. Just plug in your zip code and start scrolling. Remember, your trash is someone else’s treasure. You can view seller’s profiles with their transaction history, ratings and “badges”. Our local sheriff’s department always reminds us that we are welcome to use their parking lot as a meeting point for transactions like these. Always remember, your safety is most important. There are loads of other apps out there and new apps constantly being developed but these are what I have on my phone. Several of them are fueled in a database kind of way so I’m certain that as time goes on, they will only become more and more fantastic. On any given trip to the grocery store, I pull out my phone at least once to look something up in ThinkDirty, GoodGuide, and Healthy Living.